At least the iPhone price hike already took place. This isn't the first time that Apple (NASDAQ:AAPL) has had to increase international prices in response to currency fluctuations. 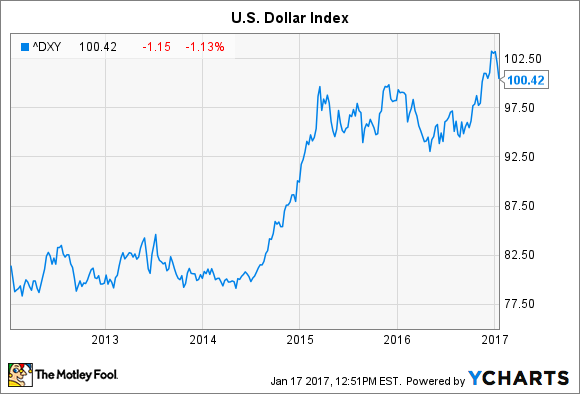 Generally speaking, the U.S. dollar has been on a multiyear run, strengthening against most of the world's currencies since 2014. In recent memory, we've seen the company adjust prices in Russia following incredible volatility of the ruble in 2014, followed by Canada, Australia, and the European Union in 2015. Importantly, currency risks aren't going away anytime soon, considering the fact that roughly two-thirds of Apple's business comes from abroad. Following the U.K.'s historic decision last summer to exit the European Union, the pound has taken an utter beating relative to the dollar. The pound's weakening is largely in response to concerns around the economic impacts of Brexit combined with capital outflows coming out of U.K.
USD/GBP exchange rate. Image source: XE.com. Annotation by author. In response to the pound's continued weakness, Apple has been forced to increase prices in its U.K. App Store by approximately 25%. This isn't a decision that Apple takes lightly; it knows that pricing volatility is bad for consumers, and price increases naturally hurt local demand. "We price our products in a way that is in general reflective of pricing here in the United States and it's a pricing that we want to keep in place for reasonable periods of time," CFO Luca Maestri noted on a 2014 earnings call. "We do not like to make sudden changes to our pricing." But Apple has to balance its own financial needs with those of consumers, and if the fluctuations are beyond the scope of its currency hedging program, it has little choice but to adjust prices in order to preserve its financials. The silver lining for investors is that adjusting App Store prices will likely have a pretty small impact on the business. Remember, this is for digital content that the U.K. installed base purchases over time, which subsequently gets accounted for in Apple's services segment. We don't know the size of Apple's installed base in the U.K., but it's not really a large country overall relative to other markets, with a current population of approximately 65 million. More importantly, Apple already increased the prices for its actual products last year, a couple months after the Brexit vote. In September, Apple increased iPhone and iPad prices, including for the new iPhone 7; the hikes ranged from 30 pounds to 60 pounds. Macs saw more meaningful increases in October, given the higher prices for computers. The Mac Pro saw a price increase of a gut-wrenching 500 pounds. Those price hikes were far more painful for U.K. customers. Europe isn't a growth market for Apple (sales up just 3% in the third quarter), but hopefully those price increases didn't hurt Apple's sales during the holiday shopping season too badly. Apple reports fourth-quarter results at the end of the month.